Am I the only one who finds serving juice to my children confusing? I want something that is good for them, but also want it to taste good. I want them to have the vitamin C, but don't want to give them too much sugar. I've been advised to only give juice as a treat and not to serve it in the mornings because that's when our bodies are the least efficient at processing sugar and carbs. Also, sometimes 100% juice is too acidic for my children's stomachs . . . I know it definitely is for mine. So what is a good compromise? I think Healthy Balance juice drinks might be a good candidate for that compromise. I think this because it is sweetened with Splenda no-calorie sweetener instead of sugar, which means Healthy Balance contains 75% less sugar, carbs, and calories than juices that are not considered better-for-you. I also like that each 8oz serving gives a member of my family 100% of the vitamin C they need for the whole day. Healthy Balance juice drinks are gluten-free and contain no preservatives or artificial flavors. So now the big question is whether the taste pleased my family. 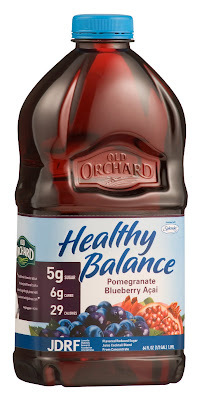 Out of the 12 flavors of Healthy Balance juice drinks, we tried the Pomegranate Blueberry Acai Juice Blend. I was nervous about the pomegranate because it can be so tart, even more than cranberries. I have to say that I was pleasantly surprised. This juice blend was extremely easy to drink. In fact, it tasted like punch. I had no problems convincing my family to drink this at all. Healthy Balance is a corporate partner of the Juvenile Diabetes Research Foundation. Visit HealthyBalance.com for information about exercising and about diabetes and to find a printable coupon for $1 off Healthy Balance juice drinks. You can also learn more by following Healthy Balance on Twitter and visiting the Healthy Balance Facebook page. Thank you to Healthy Balance for sending us a sample bottle of juice free of charge to base this review upon and for including VIP coupons and a t-shirt as a thank you for participating in this campaign.